The North Shore community has enthusiastically embraced the Frederick Thorne Nursing Scholarship Fund, which was established in 2016 in honor of Beverly Hospital’s longtime friend and steadfast ally Fred Thorne. Thorne’s legacy of giving now lives on in the fund, which will assist Beverly and Addison Gilbert caregivers who wish to obtain a nursing degree. Thorne (1935-2016) was a visionary supporter of Beverly and Addison Gilbert Hospitals, which affiliated with Lahey Clinic in 2012 to become Lahey Health. In a relationship that spanned nearly 25 years, he volunteered his expertise in a variety of capacities, including as a trustee and as founding chairman of the Northeast Health Foundation. He was a respected community leader, philanthropist and mentor at Beverly Hospital and throughout the North Shore and beyond. In June 2016, Beverly and Addison Gilbert Hospitals recognized Thorne with their first-ever Philanthropy Award. In accepting the award, he spoke of his gratitude to the entire hospital community. He noted the strong impact every individual can have and invited new generations of philanthropists to support the hospital, just as their forebears have done since 1888. The Thorne Fund perfectly reflects Thorne’s firm belief in the value of education and community-based health care. This endowed fund — supported by the generosity of longtime friends and community members — will assist certified nursing assistants, paramedics, Emergency Department technicians and others who desire a pathway to nursing. Already, the outpouring of support for the fund has been overwhelming. And in a heartwarming gesture of generosity, Thorne’s longtime friends, John and Susie Buck, offered to match up to $25,000 in gifts to the scholarship fund. The response to their challenge has seen the fund grow significantly; more than $250,000 has been raised. Click here to make a gift to the Frederick Thorne Nursing Scholarship Fund. 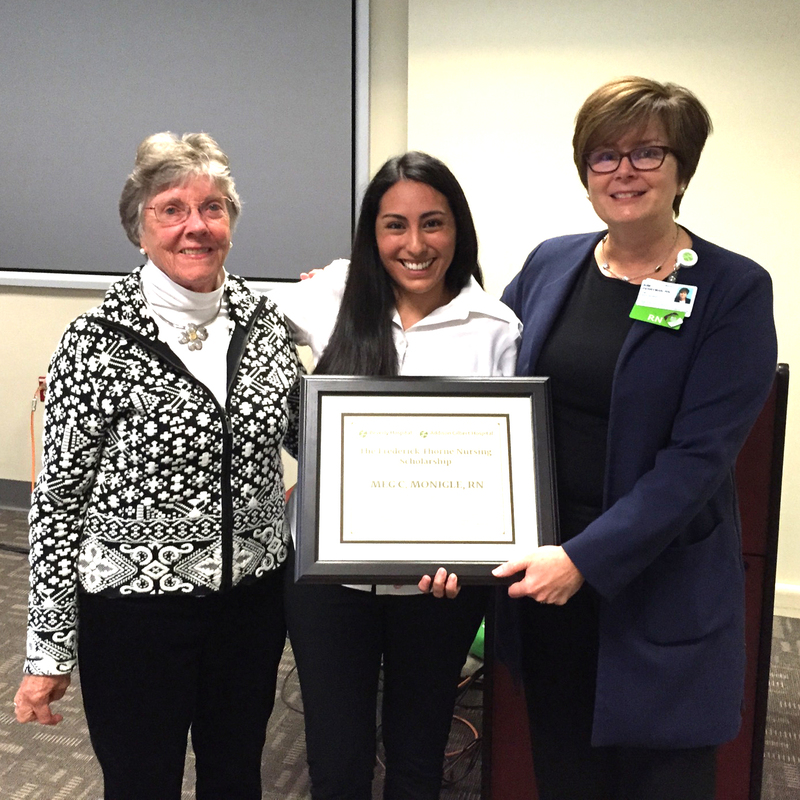 Meg Monigle, RN, (center) a nurse in the Beverly Hospital Critical Care Unit, was awarded the first Thorne Scholarship in May 2017. She is earning a BSN at the University of Massachusetts, Boston.